After the success that I had with “Your Lie in April”, I decided to tackle “Hibike! 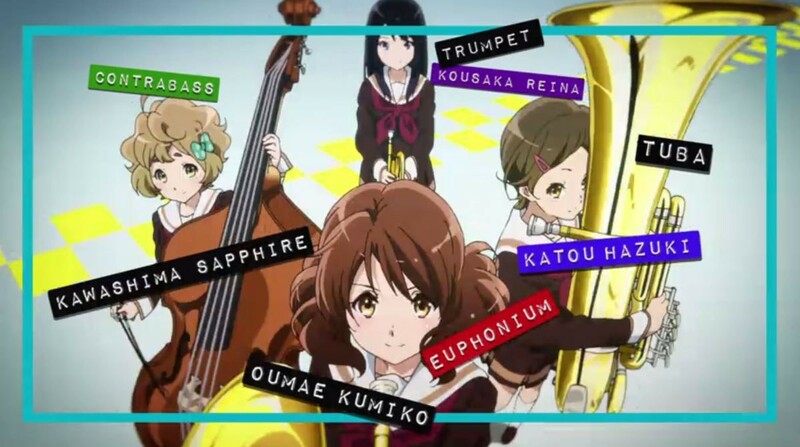 Euphonium”, another music-based anime. Well, the full title is (take in a huge gulp of air) “Hibike! Yūfoniamu Kitauji Kōkō Suisōgaku-bu e Yōkoso” or “Resonate! Euphonium. Welcome to Kitauji High School’s Wind Ensemble Club”. And if you can say that on one breath, perhaps you should consider playing the euphonium. For those who are not fully certain, a euphonium can be thought of as a smaller tuba, a bit easier to transport and with a better tone, much like its brother, a baritone horn. Anyway, to the plot. The Kitauji high school concert band club had at one time participated in national tournaments and was a champion school, but after the club’s adviser changed, they have not been able to even participate in the qualifying tournament. At this point, we are talking perhaps at least five years, and possible closer to ten. However, thanks to the newly appointed adviser’s strict instruction, the students are steadily improving and build up their strength.